Well not exactly the Oktoberfest in Munich, Germany. I guess I just really like the sound of the word and to me October in Las Vegas is really when things start to cool down and you can really enjoy being outside again. 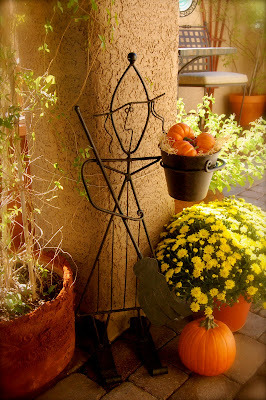 Since we don't really have much of a change of seasons here and the colors in the city are minimal, I just love to decorate with pumpkins and containers of mums and pansies. This little Fall Festival at a local middle school was fun for all. The kids enjoyed pony rides, train rides, a pumpkin patch and even a small petting zoo, not to mention lots of yummy eats like funnel cake! More Fall weather goodies later. Thanks for stopping by! WOW, I just love your pictures, It doesn't even look like they were taken in Vegas! Your pansies are beautiful. I think I need to take a little trip to star nursery and pick me up some. Love your holiday display at home - full of Fall spirit. The festival looks fun, too. I didn't even realize there were some of those in the valley. Had I known, I'd have been tempted to visit the sheep and goats : ). 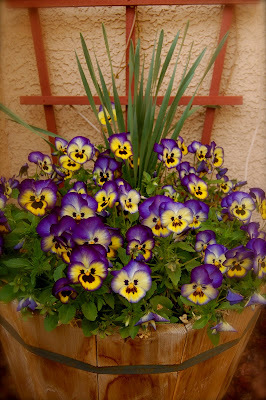 I agree with Linda, those are beautiful pansies you have.. I miss pumpkin adventure in the States, they don't have Halloween here in Korea. By the way, I am trying to generate some support for our daughter. I entered her into a Smile Contest, so if you could please vote for her (just once), the contest runs until October 31st. Your vote would be so much appreciated.